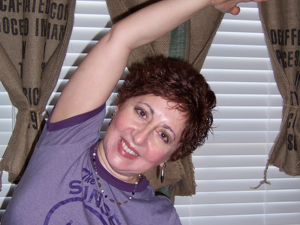 The ‘Yoga for Cancer Survivors‘ class was developed, in 2005, after I survived late-stage colorectal cancer in 2003. It combines my experience as a yoga practitioner for over twenty years, research-based practices for cancer patients, and my expertise at teaching very carefully and precisely, due to my 28 year career as a Resource Specialist . After cancer, I found myself physically, emotionally, mentally, and spiritually depleted. I needed a specialized yoga class but couldn’t find one. It dawned on me that others survivors might need one, too. There were no direct yoga teacher trainings for cancer survivors at the time. So, I chose two gentle yoga training programs that focused on deep feelings within our bodies. One is called “Meditation-in-Movement”, a restorative style of Hatha Yoga, and an adaptive form of yoga for seniors called “Silver Age Yoga”. I began teaching patients and survivors in 2005 at a local YMCA. In 2010, I completed advanced yoga studies, RYT 500, training with Atma Yoga. Atma Yoga used the ancient Ashtanga techniques of sound and vibration for healing and to relieve psychological stress. In 2011, I began training other yoga teachers to work with cancer patients and survivors on the first and only online Advanced Yoga Teacher Training for working with cancer patients and survivors. My work in this field of over 12 years has allowed me to be grandfathered into the International Alliance of Yoga Therapist (IAYT), as a pioneer in my field. “The Arts & Science” course is approved by IAYT as a Specialty Training with 100CE’s and is also approved as part of the SOUL OF YOGA ‘s Yoga Therapy Program in California. I continually update my skills with yoga trainings which enhance my ability to serve survivors. Breath work is the best way to rebuild stamina and soothe the nervous system. However, breathing exercises need to done safely, and with a research-based model. A breathing practice of 15 minutes is a long practice. We do not do any holding or pushing the breath out forcefully, as cancer recovery leaves most patients in a weakened condition. Asana practice begins with reconnecting with our bodies through slow, careful observation of movement and subtle stretching. We do range of motion in each joint. It is a most effective way to build confidence in knowing how our ”new” bodies move. We listen deeply with love and compassion. We can empower students by teaching anatomy and physiology as we teach yoga movements. We must include research facts in the class as well as use yogic philosophy to blend all possibilities of healing into a class. I see my class as a bridge to healing: empowering their healer within to develop. Some students continue to take weekly class and consider it a form of self-care to devote one hour to listening to their bodies. In class, I repeatedly give permission to “follow your own yoga”, even if that means meditating while some of us stretch. My passion is designing safe and effective classes for newly diagnosed patients, patients in active treatment, and patients in long-term treatment. At one time or another, most students fall into a deeply restorative sleep and awaken refreshed from having listened to their needs. Many times, I encourage students to change their poses, wiggle and come back to a ‘yoga face’ and to loosen their jaws. We allow “Being” with ourselves. We feel compassion for what our bodies have endured and what our spirits and minds are now challenged to integrate into our life’s story. Some students have cancer that is managed, and while they participate in other forms of exercise, they consider their hour of healing yoga a time to practice patience and acceptance. The class is done in the supine position, and so, some cancer survivors are not able to participate due to pressure on their backs. Others cannot get down to the floor, even with the assistance of a chair. One type of yoga is not going to suit every cancer survivor’s need. Of the hundreds of yoga studies I’ve read, using different types of yoga and different combinations of breath, asana and meditation, all students benefit from the practice of yoga. Finding their yoga match is something we teachers can support with information. My students report that they take the ‘Yoga for Cancer Survivors‘ CD to chemotherapy and listen because they find it soothing to focus their minds on yoga. Even if they are not actively engaged in doing the stretches, there is benefit in preparing their mind. Helping others survive cancer gives me great purpose . It is a gift to me that I am healthy enough to support others. I hope to ease some pain and anxiety during treatment . Now the YCS cd is translated Spanish and Slovene! I invite you to look over course “The Art & Science of Teaching Yoga to Cancer Patients and Survivors” and take part in a 100 hour online YCS teacher training . Approved for Yoga Therapists to take as a Specialty Training with the International Association of Yoga Therapists. No traveling. No time off work. Work at your own pace with continuous support.